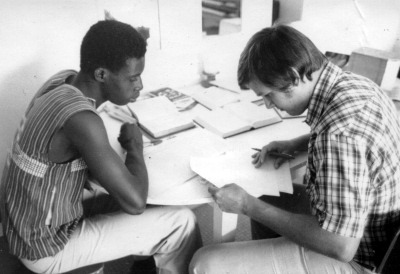 From 1978 to 1980 Dayle and I worked in the Cerma (pronounced Care-Mah), language in Burkina Faso. We lived in a place named Niangoloko. The official language of Burkina Faso is French, but it was only used in government offices. There are over 70 languages spoken in Burkina Faso. 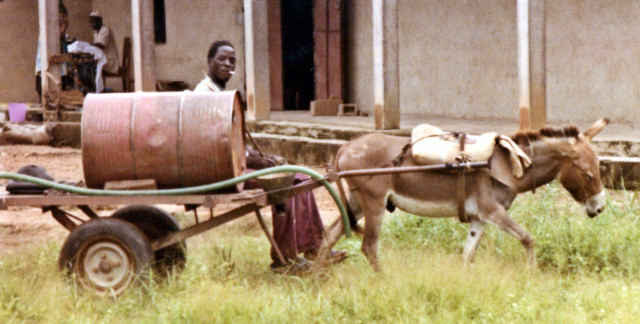 Cerma was only spoken by about 70,000 of the then 7 million people in Burkina Faso. So, on the street people who did not speak the same mother tongue used a regional language called Jula. We were cooperating with a mission which had been in the area for quite a few years. They were doing church planting and evangelism while we did Bible translation. There were few Christians among the Cerma. At one point, the mission announced that they were going to organization an evangelism campaign in Niangoloko. We offered to help how we could. In the end, we housed a missionary couple in our small place for a week. The evangelism campaign was being put on by American missionaries and pastors from Burkina Faso. The main activity took place in the evening. There was preaching and sometimes the showing of a film in the main town square. Quite a few people came and listened. Some responded to the message, but not a lot. Because none of the missionaries or national pastors spoke Cerma, all the preaching was in Jula. We were even told that ,”Everyone speaks Jula”. Neither Dayle nor I spoke it at all. During the week of the campaign, we continued working on language learning and analysis of the Cerma language in preparation for translation. We were working with a young Cerma man name Emile. One morning, he told said that many people were asking about a word which had been used in the preaching in Jula the night before. He wanted me to find out what it meant. When I suggested that he ask directly, he insisted that I ask. So I wrote down the Jula word and in the course of the day I posed the question to the missionary staying at our house. He was surprised. The Jula word meant “eternal life” and that had been the subject of the preaching the previous evening. Well, I guess that was one sermon no one understood! In the course of my years in Africa, I have come to realize how precarious communication can be when one depends on a regional language like Jula. People may speak it fluently for everyday matters – family information, shopping, farming – but lack the vocabulary for other topics which never come up when speaking the regional language. Learn more about Africa and out work there on our website, subscribe to this blog, talk with us on Facebook, or sign up to support us through prayer or finances. This entry was posted in Christianity, Faith now, Heart language and tagged cross-cultural, Eternal life, evangelism, language of wider communication, preaching, trade language. Bookmark the permalink. Another helpful article Ed. Keep up the good work in communicating the importance of translating the Bible into the many languages of the world.